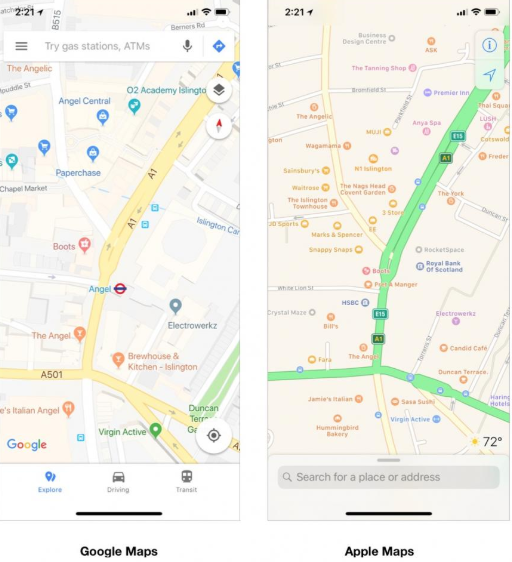 For almost eight years, Google Maps was the de facto mapping assistance on iOS and macOS devices, until Apple chose to release a competing version of the software in 2012. Nevertheless, what seemed like a quick move for the tech giant on paper ended up turning into a PR nightmare. Apple Maps received critique for inaccurate directions, a lack of assistance for public transportation, and several other glitches and bugs that made the app nearly unusable. Let’s see whether Apple Maps has been able to bounce back from it’s disappointed start? 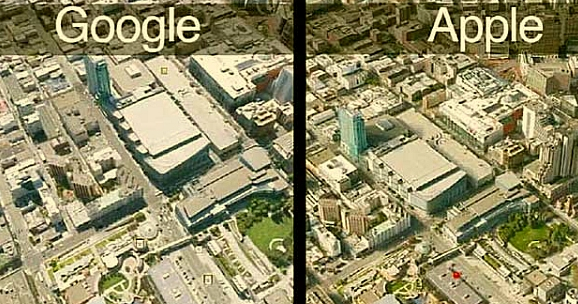 Initially, in Google Maps, there were fewer icons presented on the screen, but gradually they added more options to change the map settings such as Explore, driving, transit, satellite, terrain, traffic, and biking additionally it also added 3D models of most buildings. Apple also has these features, but not as sophisticated as Google Maps. Both apps have a current location pin on the screen — the arrow on Apple Maps and the bullseye on Google Maps. Google also has a Google Assistant button, quick admittance to input an address, and settings for users Google account and map even Apple has these functions l, but they inbuilt. Even before navigating, a user can notice a few variations in the way maps are represented. On Apple Maps, the exteriors are flatter and show more default locations. The user interface is also clean and simplistic. 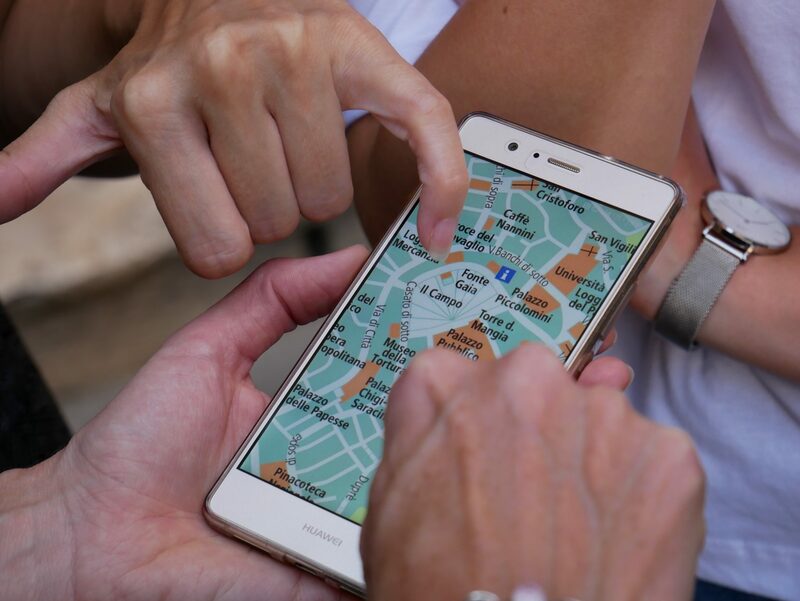 Users can search for a particular location using the search bar at the bottom of the screen and change the map settings which gives three options — map, satellite, or transit and by tapping the message button in the upper right. Apple also has design icons for landmarks, and a user can see the current weather at whatever location they are viewing at in the lower right. When we compare the navigation screen, the screen doesn’t have many icons, which restricts distractions if the app is used while driving. If the zoom or the walking option is selected, more locations can be explored. When compared to Google, it has more icons, most of these options are gas stations and parking lots which can be placed to stop while driving. Even when the walking mode is selected, more general locations are displayed. Apple and Google map base their arrival estimations on prevailing traffic conditions. Red sections along user route symbolise heavy traffic, yellow to moderate traffic, and blue is no or little traffic. A user may also see several alerts, from accidents to road closures. Google is a bit explicit when it comes traffic impact and arrival estimation. Other than these distinctions, estimation is similar for both versions. Google has some extra features available on the main screen, such as sound, compass, and quick search, making it accessible to tweak settings. This feature is available on Apple Maps as well, but it has to be pull up from the bottom portion of the screen and press the identical category, which makes it a bit complicated. There are some prominent features for Apple Maps, such as is its synthesis with iOS. Telling Siri where we want to go, and it will initiate the directions. Users can also open maps, cancel an in-progress route, and make other minute adjustments by using their voice. 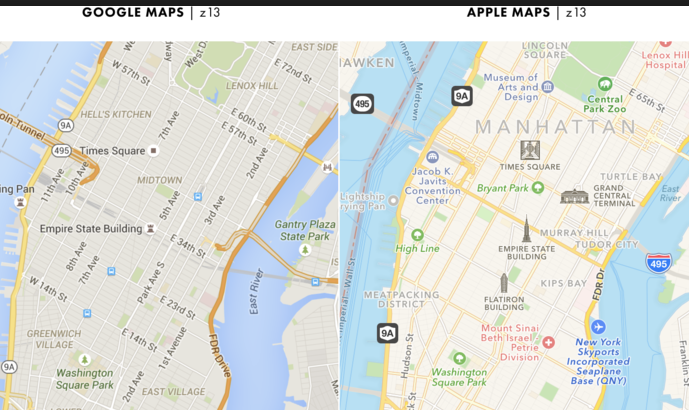 Apple Maps also practices vector graphics, which means it uses less data when compared to Google Maps. Another advanced feature for Apple Maps is Flyover Mode. This feature allows users to explore densely populated urban centres in 3D landscapes comprised of illustrations of buildings and structures. Flyover also has an option called as City Tours, which acts as a guide for several landmarks in a city. There is no equivalent feature in Google Maps. In a counter to Apple Flyover mode, Google has Street View, which gives panoramic views of streets around the world. Google also gives customisation option to its users by attaching stops and withdrawing tolls. 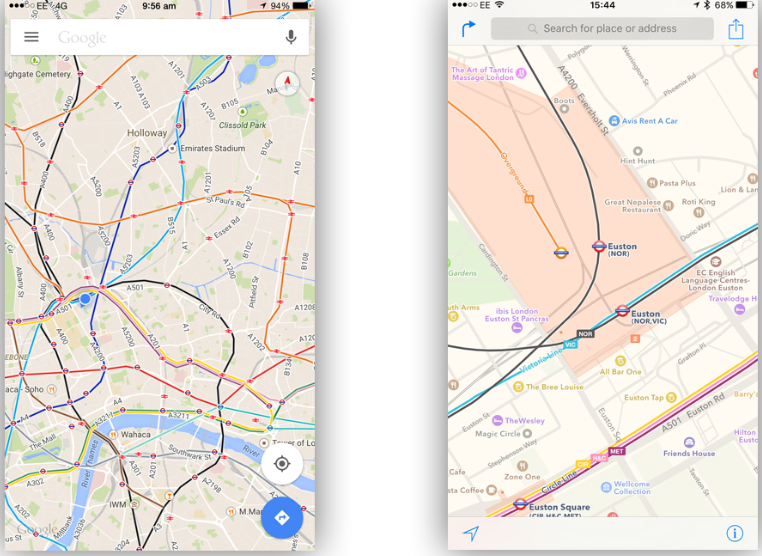 Apple Maps have two big draws when compared to Google Maps and they are Google’s bicycle maps and offline accessibility. In a bike-friendly centre, this is really advantageous, and Apple Maps doesn’t have this functionality. Apple Maps recently added bike-sharing stations to its list of places, but this cannot be compared to Google’s feature. 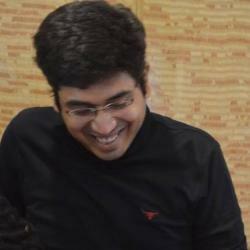 Google supports primo offline planning for those with insufficient access to WiFi or data. 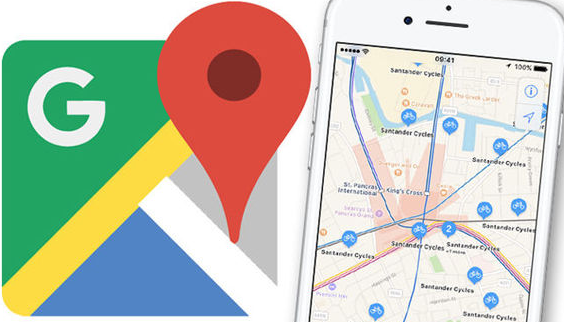 Apple Maps may use slightly less data than Google Maps but Google dominates by allowing users to download entire localities of maps for offline use. Coming to software combination, Google tends to have small city mapping data. Google also has information about opening times of businesses, descriptions, photos, and user-generated star grades. Apple has this as well but in less amount. Apple does also incorporate TripAdvisor, Yelp, and other third-party app classes. Google has released several updates which allow users to see average wait times at restaurants, classify through reviews, and discover and travel to new places efficiently. Aiming to make GPS navigation better and ride-hailing comfortable for iPhone users in India, Apple on recently rolled out turn-by-turn directions as well as assistance for cab-hailing apps Uber and Ola in Apple Maps. Adding these regional turn-by-directions makes owning Apple devices further appealing for domestic consumers. 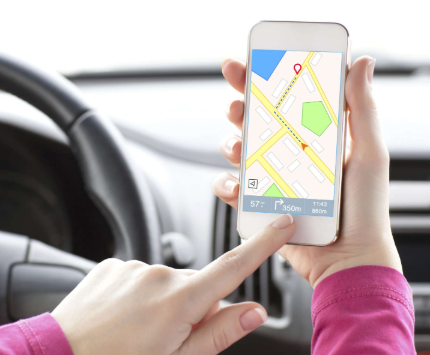 users had the freedom to download a third-party maps app on the App Store, but features like proactive alerts, or Apple Watch navigation are best offered by Apple Maps. These features are expected to give tough competition to Google Maps.